OMG, Nancy, what an incredible story. Your broach is amazing (what else would I expect?! )...I know it will be a hit! 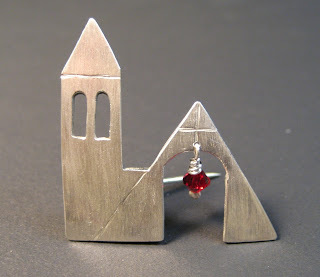 this is an amazing broach. It meant so much, Nancy. Your piece was just lovely. Nancy B. wore it proudly on her lapel for the entire auction. I know she was touched by your handwork and thoughtfulness (as I was). You rock! Nancy that is a great translation of her logo. Really wonderful! And a great cause. lovely brooch nancy. i love the little dangle.